The Islamic State on Wednesday claimed responsibility for a suicide attack in the southern Philippine province of Basilan that left over a dozen casualties. 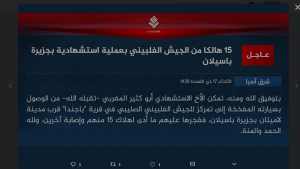 In a post on its Amaq News Agency, the Islamic State said a Moroccan man carried out the daring assault against Filipino soldiers in Lamitan City on Tuesday and has identified the executor of the suicide bombing as Abu Katheer al Maghribi. 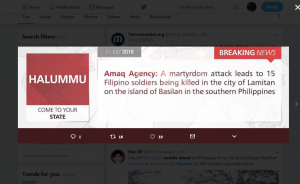 “A martyrdom attack leads to 15 Filipino soldiers being killed in the city of Lamitan on the island of Basilan in the southern Philippines,” it said. Philippine authorities said 11 people were killed when a car bomb exploded at a security checkpoint after government militias stopped the suspicious vehicle in Bulanting village, about 2 kilometers away from downtown Lamitan. The Philippine military tried to downplay the explosion, saying, there was no proof that it was a suicide attack despite several witnesses reports claiming witnesses had seen the bomber before he detonated his van. Lamitan Vice Mayor Roderick Furigay, quoting a report, also said that the driver appeared to be a foreigner and could not speak the local dialect when stopped by soldiers at the army checkpoint. The powerful explosion obliterated the vehicle and left a huge crater and among those killed were a woman and a child; and the militia commander whose unit is under the supervision of the Philippine Army. Five soldiers and several civilians were also wounded in the explosion. Reports said the bomber came from a nearby town and heading to downtown Lamitan when his vehicle was stopped at the checkpoint. Governor Mujiv Hataman, of the Muslim autonomous region, has strongly condemned the violence. He said a total of 11 people were killed in the blast. “We mourn the loss of lives in this senseless attack to our safety, and we continue to thank those who have devoted and continue to devote their lives to securing peace in the Bangsamoro. The commitment to rights and safety of our people that we share with them defines our collective efforts, and we continue to stand and work with them as we seek justice for those who have lost their lives to conflict and violence,” he said. Hataman also downplayed claims by the Islamic State, saying, it was propaganda by the terror group. “Mahilig naman mag-claim mga yan. Mga yan mahilig din mag-propaganda. Hindi naman suicide yun kasi nasita,” he told the regional newspaper Mindanao Examiner. The province is a also known stronghold of the militant group Abu Sayyaf whose leaders have pledged allegiance to the Islamic State. 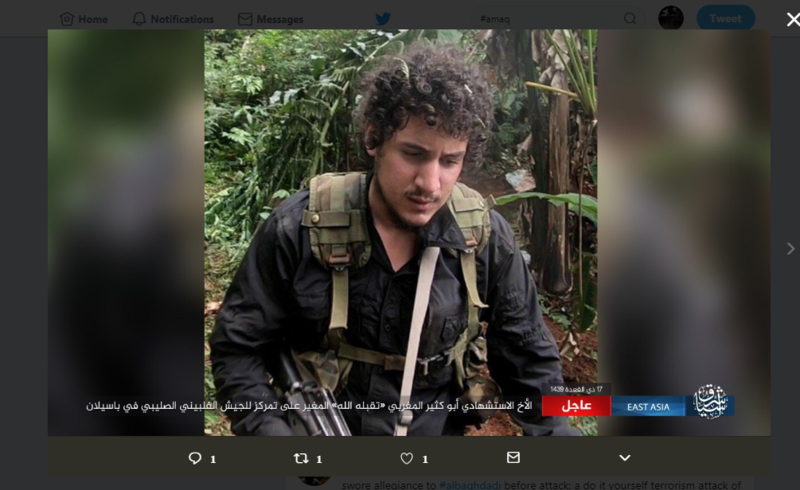 Several foreign fighters had been killed in clashes with soldiers in Basilan in recent years. The Philippine military earlier urged the public to be on alert and stay vigilant at all times following attempts by pro-ISIS militants to bomb civilian targets in the restive southern region. President Rodrigo Duterte has repeatedly called on militants to talk peace and also promised amnesty and financial aid if they surrender to the government. The Bangsamoro Islamic Freedom Fighters: The Newest Obstacles to Peace in the Southern Philippines? RSIS Commentary:A new “caliphate” in the Middle East--Is there an Abu Sayyaf-ISIS Link? The Philippines: A New Strategy for Peace in Mindanao?